Dear friends of ours recently got engaged and after a wonderful engagement party we decided to host a more intimate brunch on Sunday morning. We co hosted with another couple and I was responsible for a hot dish, a fruit dish, and beverages. Two things I knew for sure, fruit salad and mimosas were in order! I asked CWM what kind of hot dish he wanted and he requested french toast. We both love it but I wanted to spice it up a bit. I started browsing the internet and came across a delicious cinnamon french toast idea. 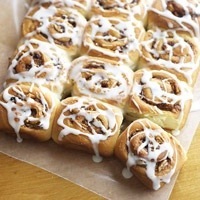 I started with this recipe for cinnamon buns and went from there! I ended up making another batch as I wanted to be sure to have extra left over, and I had more than enough for 6 people! When I got too the stage where the rolls were done and I had sliced them into eight, I then cut them into fours and threw them all in a deep baking dish. Toss your cinnamon buns pieces in this mixture and bake for 30-40 minutes at 350. I then whipped up my favourite cream cheese icing and spread over top right before serving! I think it was the star dish! The fruit salad was a combination of strawberries, bananas, pineapples, kiwis, blueberries, and cantaloupe. Served layered in a clear glass bowl with a strawberry yogurt, whipping cream, vanilla and honey it was the perfect balance with the heavy cinnamon bun french toast. Unfortunately I was too busy having fun to snap any photos but I encourage you to try either of these recipes out and I guarantee you will be the hit of the party! Once again I would like to wish nothing but love and happiness for Kayleigh and Joe and cannot wait until the big day!